Our business began in 1972. Since then, it has been our mission to offer to the public some of the finest quality antique pewter available in the marketplace. We are constantly striving to obtain fine examples of American and British pewter for the beginning and serious collector alike. We have helped many collectors build important collections and obtain specific items for their collections. We maintain an active want list and we can help you. All of our pewter offered for sale is carefully conserved by the most modern methods. Care is taken to preserve the authenticity of each piece while removing unsightly dents and discoloration. Each piece is carefully hand polished to present the piece in the way it would look while it was in daily use. We do on occasion offer pewter in "as found" condition. We also carry a selection of antique coverlets, baskets, and iron for the hearth. Pictures and information are available upon request. We have on occasion restored important pieces of pewter for collectors and institutions. Due to the time involved in completing a proper restoration we are limited to the time we can devote to outside work. Please contact us concerning any restoration work you may need. All items are guaranteed for authenticity and condition. Click here to read more about our Terms of Sale. Gibson Pewter Second-generation pewterer, Jonathan Gibson carries on the craft year-round in the same 200 year old barn where he apprenticed as a young boy. Click here to visit the Maine Antiques Digest website. 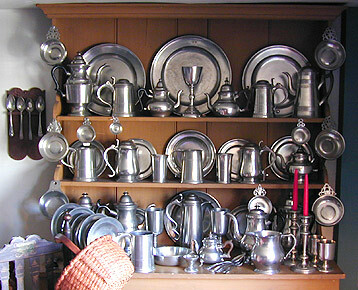 We encourage visitors to our web site to visit the web site of the Pewter Collectors' Club of America, Inc. This organization was established in 1934 for the purpose of fostering interest in the study collecting and preservation of antique pewter. We think you may enjoy this organization. The Herrs Antiques - Don and Trish Herr have been antiques dealers doing business as The Herrs since 1975. specializing in distinctive Pennsylvania German decorative arts.